Spend any time watching the night sky and you’ll soon recognize that stars have different colors. Some are white, others yellow or red, and some are blue. Blue stars are made of the same stuff as all the other stars in the Universe; they’re about 75% hydrogen and 24% helium with trace amounts of other elements. So what makes a blue star… blue? The color of a star comes from its temperature. The coolest stars appear red, while the hottest stars are blue. And for a star, the only thing that defines the temperature of a star is its mass. Blue stars are stars that have at least 3 times the mass of the Sun and up. Whether a star has 10 times the mass of the Sun or 150 solar masses, it’s going to appear blue to our eyes. An example of a blue star is the familiar Rigel, the brightest star in the constellation Orion and the 6th brightest star in the sky. Astronomers calculate that Rigel is approximately 700 and 900 light-years away, and yet it appears almost as bright as a star like Sirius which is only 8.3 light-years away. The temperature of Rigel is approximately 11,000 Kelvin; it’s this high temperature that accounts for Rigel’s color. Rigel puts out about 40,000 times the energy of the Sun. An even more extreme example of a blue star is the blue supergiant Eta Carinae, located about 8,000 light-years away in the Carina constellation. Again, Eta Carinae is 10 times further away than Rigel, and yet from our perspective it’s only a little dimmer. The surface temperature of Eta Carinae is 40,000 Kelvin, and it shines with much of its radiation in the ultraviolet spectrum. Since this wavelength is invisible to our eyes, we perceive it as blue. All told, Eta Carinae is blasting out 1,000,000 times the energy of our Sun. 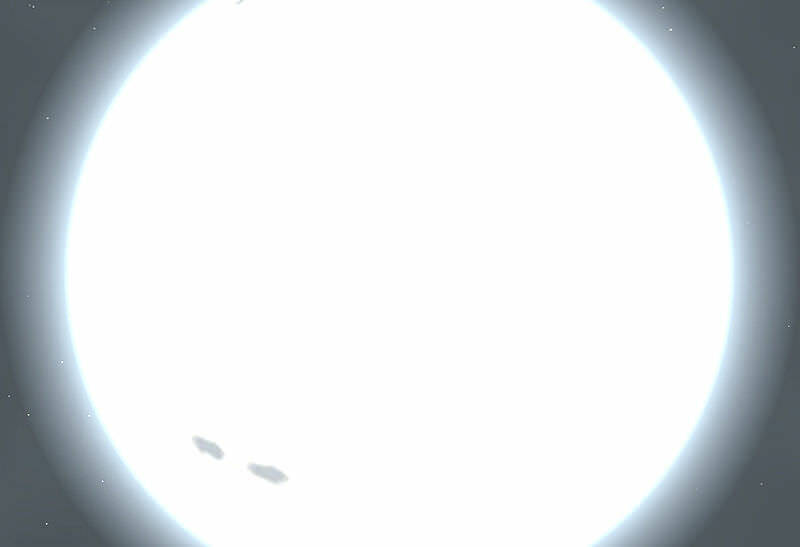 Blue stars burn through their fuel at a tremendous rate. With 150 times the mass of the Sun, Eta Carinae has only been around for a few million years and it’s expected to detonate as a supernova within the next 100,000 years. Our Sun, in comparison, has been around for 4.5 billion years and is expected to live another 7 billion years. So, remember, blue stars are blue because of the temperature of their surface. And they’re so hot because blue stars are much more massive than cooler stars like our Sun. We have written many articles about stars on Universe Today. Here’s an article about the constellation Orion, which includes Rigel, and here’s an article about Eta Carinae.